ShelterBox and Rotary have been official Project Partners in disaster relief since 2012, but have worked closely together for more than 16 years, as one of the world’s most effective humanitarian collaborations. Together, we provide lifesaving assistance to millions of people who have lost their homes through conflict and natural disasters. ShelterBox began in 2000 when the Rotary Club of Helston-Lizard championed the simple idea to package up essential shelter items in the now iconic green ShelterBoxes for their millennium project. With Rotarians at its heart, ShelterBox has grown to become a major force in humanitarian aid and a world-leading expert in emergency shelter. Rotarians and Rotary groups across the UK and globally support ShelterBox in a range of essential ways, from raising vital money and awareness at home, to helping hand-deliver the charity’s emergency aid to families in desperate need across the world. Together, ShelterBox and Rotary cross boundaries and cut through red tape to reach even the most remote communities. Each disaster is different, and so is every community. ShelterBox doesn’t believe that one size fits all, so has worked hard to expand the range of kit provided. Considered assessments are made in each disaster situation, to ensure families are provided with the right support they need to recover. The aid ShelterBox supplies comes in the form of ShelterBoxes and ShelterKits. The sturdy green ShelterBoxes typically contain family-sized tents specially designed to withstand the elements and provide people with temporary shelter. The ShelterKits contain all of the essential tools people need to start repairing and rebuilding their homes. Both are usually provided with additional items that help transform shelter into a home, such as cooking sets, solar lights and blankets. ShelterBox tests and evaluates all the aid provided by talking to, and learning from, the families who use it. This fuels ShelterBox to remain innovative and ensures it continues to evolve. After considered assessments, aid is delivered to families in need by whatever means necessary: air, sea or land. Aid is accompanied by highly-trained ShelterBox Response Teams, who will work directly with local communities and partner with other organisations such as Rotary, government bodies or other aid agencies to make sure that they get the right support to the right people. To be able to act rapidly after disaster strikes ShelterBox has pre-positioned stock in strategic locations around the globe. Although more aid may need to be sent, stored aid allows for an initial response to happen much more quickly. 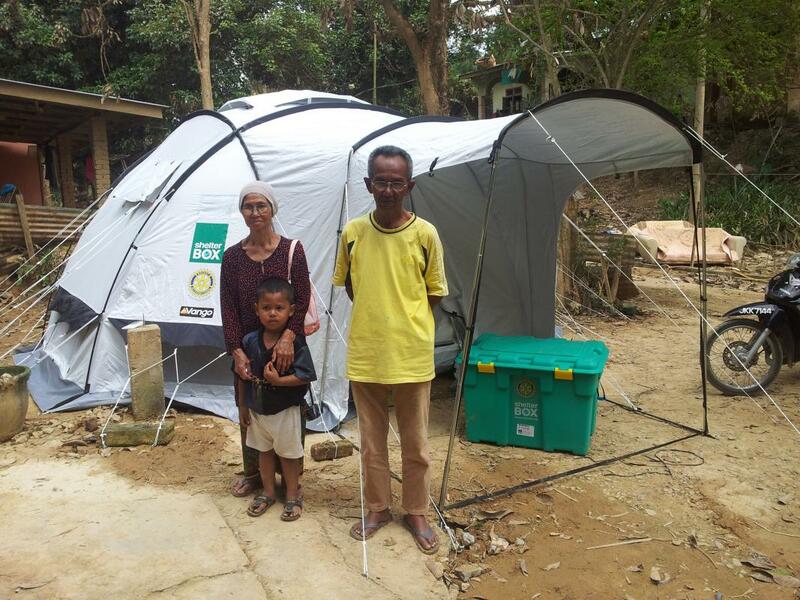 ShelterBox, alongside Rotary, has helped to rebuild communities after some of the largest natural disasters this century has seen, from the Boxing Day Tsunami in 2004 and Typhoon Haiyan in the Philippines in 2013 to the massive earthquakes that devastated Haiti in 2010 and Nepal in 2015. ShelterBox is however active 365 days a year, transforming lives after disasters that haven’t made the headlines. Rotary clubs are a vital part of ShelterBox, supporting field operations in 90% of its worldwide deployments. More often than not, it will be a Rotary club that is the first point of contact for the Response Team when they arrive in a country. Rotarians provide logistical support or act as consignees, ensuring aid can be delivered in country. Rotarians also help spread the word of ShelterBox and organise creative fundraising activities with their wider community. Together, Rotary and ShelterBox have helped more than 240,000 families recover from the devastating impact of disaster. Currently, 65 million people have been made homeless by natural disaster and conflict. All predictions point to the fact that the number of people who will lose their home each year is set to only grow. ShelterBox exists to help as many of these people as possible. The ongoing support of Rotary clubs around the world is vital to enable the provision of shelter to many more families in need.